And when will be the first launch? Out of curiosity, once this is built, will it allow spacex to increase launch rate? Rails on a significant incline are unexpected. In addition, the launch pad in California does not use rails, so we know they possess the technology. Increase launch rate? Oh yeah, Baby! Rails are better at carrying heavy loads. But rails are worse at carrying loads at an incline. The coefficient of friction of steel upon steel is much smaller than rubber against concrete, for example. I understand that the crawlerway was not lined with concrete, but rather with gravel, and crawlers used tracks made of steel sections. Anyhow, it appears that the key technology that makes these rails possible is a trackmobile that depends on rubber traction wheels. FH is lighter than saturn and shuttle and both used that crawler. I know about dragon, but this is about a launch pad. Seems like it should be ready long before may 2017. The powered wheels are on the rails. The bogie with rubber tires which carries the upper part of the rocket is unpowered. It seems that the rails provide enough grip to pull it up the hill. Which does make sense, considering that those wheels will be carrying the vast majority of the load. It’s not like this is a locomotive pulling a mile of freight cars. The first launch at 39A is slated to be the Falcon Heavy demo flight in December 2016. It should help a bit, since they should then be able to process to launchers and payload simultaneously. 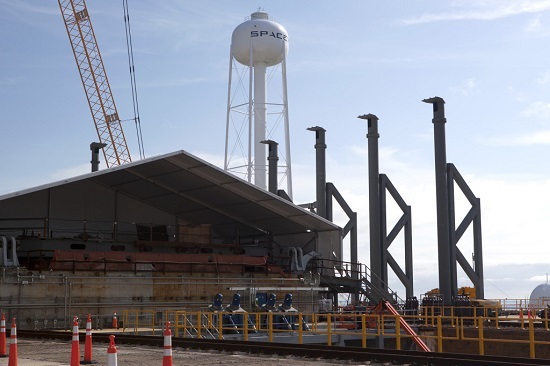 But what will really help is the Boca Chica launch pad under construction in Brownsville, Texas, since there SpaceX will not have to coordinate their launches with the USAF and ULA. Yes it does, very expensive river rocks imported from out of state from a very specific location. The river rocks were used to stabilize the crawler/Saturn stack during roll out. It also handled the load better than concrete due to the nature of the soil down in Florida. BTW if you ever get a chance to see the crawler way in person do NOT try to take any of the rocks with you. Theft of gov’t property is a felony…. I think his point is that the dirt ramp would be unsuitable for a heavy vehicle running on pneumatic tires. The rocks used for the crawlerway are really only suitable for a tracked vehicle like the crawler-transporter. Notably, it’s also transported horizontally in the same manner as Soviet and Russian rockets. That allows the load to be spread over a larger area. I guess that the plan is to debut the Falcon Heavy there before the end of the year. Fingers crossed. Rails are not better carrying heavy loads. Rails are better guiding linear loads. If you want to carry heavy loads, SPMT are better. I don’t think traction is an issue as the transporter isn’t self propelled. I believe in one previous photo I saw it was actually attached to a cable so it is in effect winched to the pad. So rails are used for guidance and weight bearing. And cables have the ability to traverse steep inclines. Think of inclines railroads and ski ifts. I would not be surprised if SES-10 is the first launch from LC-39A (SES wants to get away from the Air Force controlled launch site), and the CRS-10 mission will probably be launched from there also, prior to the Falcon Heavy demo launch. 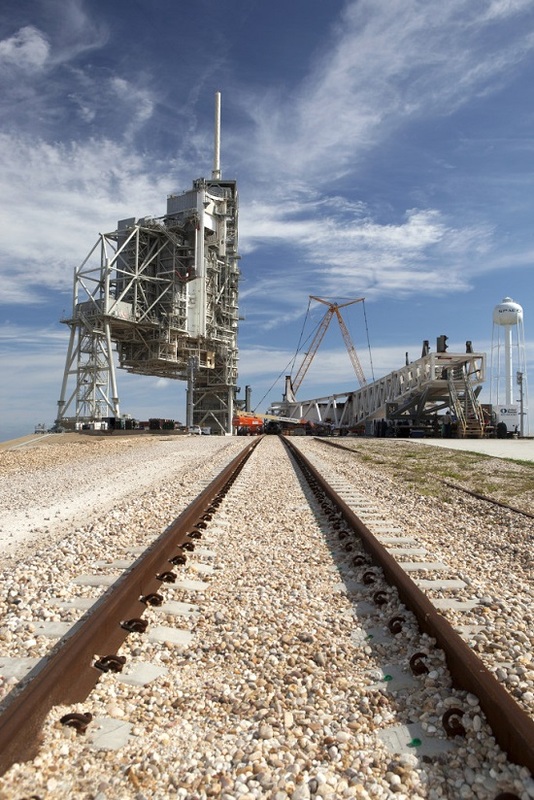 SpaceX has said before they are going to transition all the NASA launches, both cargo and crew, to LC-39A. Also the SES-10 NET launch date coincides nicely with Musk’s announcement of re-flying a booster (used for CRS-8) for a paying customer in September. An SPMT is good for carrying many different types of loads, but this is a custom system that’s much more straightforward. Rails are good at carrying heavy loads because the force is distributed over an extremely large area. In the second picture, I see a bunch of vertical steel beams that are outside the current frame of the some sort of storage building. I don’t think that’s the HIF in the picture, but what are they building in this area ? 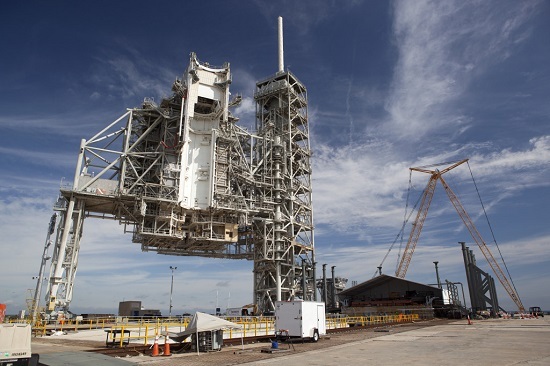 If there is a building that hasn’t been erected yet, that will definitely postpone any launch from LC 39. The vertical pipes supported by a framework of beams on either side of the building in the first picture are not the HIF, they are up on the pad (the HIF is downhill from the pad). Those are water pipes for the sound suppression system – big sprinklers.